Let the sunshine come right in! Nothing says “dreary” like dirty windows. They obstruct the outside view, restrict sunlight and give an unkempt appearance to even the prettiest of houses. But nothing says “work!” quite like cleaning them. So how do you solve this conundrum? Depending on the size of the task — spot cleaning or washing every window inside and out — there are a couple of ways to get the job done. We reached out to green cleaning expert Leslie Reichert for all her tips on the best way to clean windows. Use the damp cloth to spot clean fingerprints and smudges on windows as needed. Remove built-up scum, algea and grime on exterior windows using an old, wet towel and a bucket of water with a drop or two of dish detergent. Dry windows using a microfiber cloth. If you need extra cleaning power, use a DIY cleaner (a few drops of dish soap, half a cup of white vinegar and three cups of distilled water). Mix and spray onto windows. Wipe with the microfiber cloth. Change or wash the cloth when it starts leaving residue behind. To clean sills, wipe with large-looped microfiber. Sweep away debris in window tracks using an old, clean paintbrush. Clean hard-to-reach places using a toothbrush. 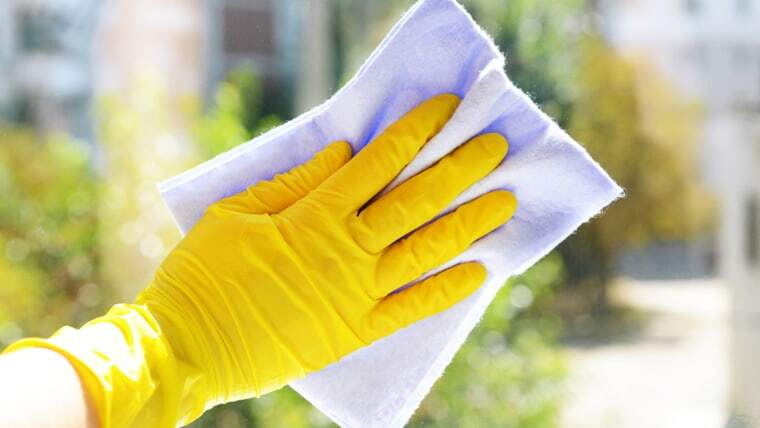 As effective as wiping by hand is, if you’re cleaning lots of panes, it can become a real pain in the biceps. For these larger jobs, Erin McDermott, communications specialist at Window Genie, a national home services franchise, recommends using a sponge, a rubber-edge squeegee, a microfiber cloth and a bucket of water with a few drops of dish detergent. Using the sponge, apply cleaning solution, giving an extra scrub to areas with built-up dirt. Remove water using the squeegee, taking care to wipe the blade after each stroke. This keeps the grime from building up and scratching the surface of the windows. Use a damp microfiber cloth to wipe up drips. Do not clean in direct sunlight or while the glass is hot. If the solution dries too quickly, it will actually cause streaking and leave behind a film that will attract dust and dirt. Clean your window screens when you clean your windows (twice a year or as needed). If not, the dirt on the screens will end up on your windows after the first rain. Stay alert — even on a step ladder. Most ladder-related injuries actually occur on step ladders that stand only 3-to-6-feet tall. Keep three points of contact with the ladder at all times —two feet and one hand. Never set up a ladder on slippery surfaces, such as pebbles, rocks, sand, wet grass, an incline, edging stones, area rugs, snow, ice or newly stained decks. Ladders should have leg levers to make an exterior surface level and stabilizer bars to keep from sliding side to side. This article was originally published on May 26, 2015.